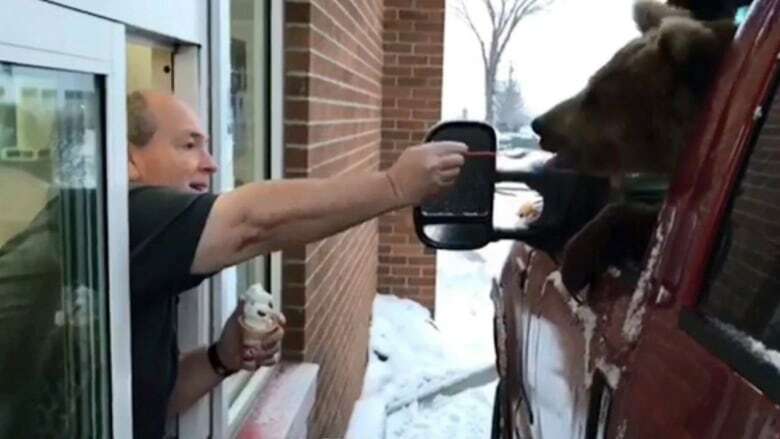 A private zoo in central Alberta has been charged after a bear from the facility was taken through a Dairy Queen drive-thru in a pickup truck and fed ice cream through the vehicle's window. A video of the unusual feeding was posted on social media in January by Discovery Wildlife Park in Innisfail, Alta. It showed a one-year-old captive Kodiak bear named Berkley leaning out of a truck's window and being hand fed ice cream by the owner of the local Dairy Queen. Bear experts called the video irresponsible and disrespectful, but one of the zoo's owners initially defended it, saying the message was supposed to be about safety. "The message was: Don't feed the bears. Don't stop on the side of the road. If everybody would listen to the video, that's what the message was — don't do this," Doug Bos said in January. The video includes information about how well bears can smell and advises viewers not to get out of their vehicles to take photos of wild bears. The video was initially posted to Twitter and Facebook on Jan. 14 by Discovery Wildlife Park, but the posts were later taken down. Another video posted by the zoo on Jan. 16 showed Berkley licking frosting off an ice cream cake. Kim Titchener, who runs a wildlife protection organization called Bear Safety & More out of Canmore, Alta., said videos like this send the wrong message about how to interact with wild animals. "It's a challenge every day out there in our parks and protected areas to try to teach people who are visiting these places or live here in Alberta that we don't feed wildlife, that we don't feed bears," she said. A trainer at Discovery Wildlife Park said there was no safety concern at the Dairy Queen because the bear was on a chain in the truck the entire time. "There was never any public present. It was done long before the Dairy Queen even opened," Serena Bos said in January. "Berkley is a captive bear, so not a wild bear in any way." The bear came to the zoo from a facility in the United States, she said. Provincial officials began investigating the initial video — along with the terms of the zoo's permit, which is regulated by Alberta Environment and Parks — earlier this year. Wildlife officers have now charged the zoo with one offence relating to the bear being taken for ice cream, and another that stems from the bear leaving the facility on other occasions in 2017 without the province being notified. Discovery Wildlife Park owners Doug Bos and Debbie Rowland are scheduled to appear in provincial court in Red Deer, Alta., on May 28. Bos said they plan to plead guilty. "What we got charged for under the act was that we failed to notify them that we were going to do those things," he told The Canadian Press in an interview Tuesday. "We were busy. We made a mistake and we didn't email them and tell them." The zoo's permit has also been revised to impose new conditions. They include requiring the zoo to provide more details when asking to transport a controlled animal or wildlife and to keep those animals in a cage, crate or kennel when in a vehicle. It also says the zoo cannot put any animals on display outside the facility without prior permission from the province, nor can it allow any member of the public to have physical contact with animals such as monkeys, cougars, wolves or bears. Innisfail is about 115 kilometres north of Calgary. Couple charged in relation to cheetah spotted wandering in B.C.